A dying Japanese zillionaire in "The Wolverine" is shown lying on a shiny CGI platform made of upright metal rods that automatically conform to his every change in position. That high-tech bed of nails looks so ridiculously uncomfortable that a simple real-world adjustable mattress would have made a lot more sense. In the same way, the movie itself is at its best when it sticks to the simple basics, but loses credibility when it goes overboard with comic-book special-effects silliness. Granted, that may seem like an odd criticism about a story whose main character is an immortal mutant who can pop metal blades from his fists. Sometimes, though, the whole suspension-of-disbelief thing only goes so far. What's impressive is how well the movie's first half succeeds with a "less is more" approach. Hugh Jackman returns as the iconic Marvel Comics hero he has portrayed in four X-Men movies and in 2009's solo "X-Men Origins: Wolverine." The character is referred to throughout as Logan, and is haunted by guilt over killing his true love Jean Grey (Famke Janssen) in "X-Men: The Last Stand." He had a good reason for giving her that lethal poking, but still. Jean shows up in Logan's guilty-conscience dreams throughout the movie, urging him to join her in death. Now living in the snowy woods and described by one character as looking like a caveman, Logan has made an anti-violence vow that he obviously won't be keeping. Punky redhead Japanese swordswoman Yukio (Rila Fukushima) seeks Logan out to tell him that a man he saved in World War II wants to see him one last time in Tokyo. Knowing that Logan is fed up with living, the terminal patient Yashida (Haruhiko Yamanouchi) offers to transfer Logan's healing power to himself. Logan declines, but soon realizes he somehow has become all too mortal overnight. In the process of saving Yashida's shockingly beautiful granddaughter Mariko (Tao Okamoto) from kidnappers at a memorial service, Logan is alarmed to realize he can't shrug off slashes and gunshots anymore. That kryptonite-like plot element makes Logan more vulnerable both physically and emotionally, giving him a humanity that Jackman is good at conveying. So battered that he collapses at one point from blood loss and has to be sewn up, Logan also falls for the irresistibly lovely damsel in distress Mariko. The movie's big surprise is how enjoyable it is to watch Wolverine when he is reduced to being only a tough guy with claws. Sure, he's still able to duke it out with baddies on top of a speeding bullet train, but he's not doing much more than what those regular joes are accomplishing with swords alone. 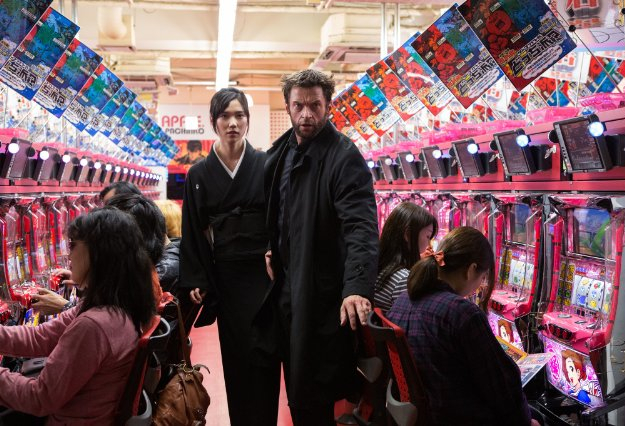 Likewise, Logan's on-the-run and hiding-out scenes with Mariko are almost classy in their relative restraint. Director James Mangold ("Walk the Line," "3:10 to Yuma") has an elegantly unflashy style in those segments that makes junk like "Iron Man 3" look, well, childish. That's why the movie's bigger-but-not-better final act feels inconsistent and unsatisfying. Another mutant is one too many, a giant CGI robot seems cheesy and the various plot threads don't add up to make any sense. The screenplay (by Mark Bomback and Scott Frank) also contains one outright cheat that robs us of the chance to see Logan holding his own heart in his hand as promised. Also, shouldn't Logan's razor-sharp and stronger-than-any-other-metal adamantium claws be able to cut through swords? Discuss. "The Wolverine" is loosely based on a 1982 comics series by Chris Claremont and Frank Miller, but neither of those names can be found anywhere in the credits. Len Wein and John Romita also get no "created by" credit for coming up with the character himself in 1974. Old comic-book guys get no respect, I tell ya, no respect at all. The 3D version is adequately bright, if you enjoy paying extra and wearing those annoying glasses. And be sure to stay through the credits for a major "X-Men: Days of Future Passed" (coming 2014) teaser that should make fanboys cheer.